An ambulance worker holds a flare as he and his fellows block the Place de la Concorde in Paris, Monday, Dec. 3, 2018. Ambulance workers took to the streets and gathered close to the National Assembly in downtown Paris to complain about changes to working conditions as French Prime Minister Edouard Philippe is holding crisis talks with representatives of major political parties in the wake of violent anti-government protests that have rocked Paris. 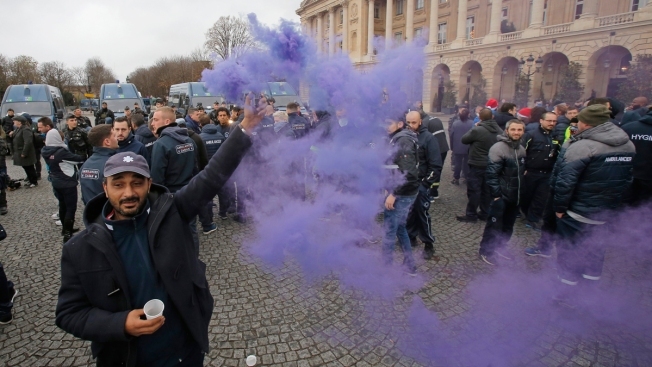 The French government's decision to suspend fuel tax and utility hikes Tuesday did little to appease protesters, who called it a "first step" and vowed to fight on after large-scale rioting in Paris last weekend. In a major U-turn for the government, Prime Minister Edouard Philippe announced in a live televised address that the planned increases, which were set to be introduced in January, were now being postponed until the summer. The backpedaling appeared to be designed to calm the nation, coming three days after the worst unrest on the streets of Paris in decades. "No tax is worth putting the nation's unity in danger," said Philippe, just three weeks after insisting that the government wouldn't change course and remained determined to help wean French consumers off polluting fossils fuels. Protesters wearing their signature fluorescent yellow vests kept blocking several fuel depots Tuesday and many insisted their fight wasn't over. "It's a first step, but we will not settle for a crumb," Benjamin Cauchy, a protest leader. More than 100 people were injured in the French capital and 412 arrested over the weekend in Paris, with dozens of cars torched. Shops were looted and cars torched in plush neighborhoods around the famed Champs-Elysees Avenue. The Arc de Triomphe, which is home to the Tomb of the Unknown Soldier and was visited by world leaders last month to mark the centenary of the end of World War I, was sprayed with graffiti and vandalized inside. Philippe also announced that electricity and natural gas prices will be frozen until May 2019 in a move aimed at improving spending power. Philippe's announcement is unlikely to put an end to the road blockades and demonstrations, though, with more possible protests this weekend in Paris. A soccer game between Paris Saint-Germain and Montpellier which was scheduled for Saturday in Paris was postponed after police said they couldn't guarantee security amid expected protests in the capital. "If another day of protests takes place on Saturday, it should be authorized and should take place in calm," Philippe said. "The interior minister will use all means to ensure order is respected." The protests began last month with motorists upset over the fuel tax hike but have grown to encompass a range of complaints, with protesters claiming that Macron's government doesn't care about the problems of ordinary people. Since the movement kicked off on Nov. 17, four people have been killed and hundreds injured in clashes or accidents stemming from the protests.